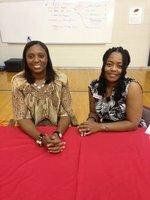 Mrs. Monica Andrews is Coordinator and Mrs. Angela Thomas is Clerk of the Millbrooke Family Resource Center. The purpose of the FRC is to assist in removing non cognitive barriers to learning for students. Non cognitive barriers include an array of basic needs in which some families have difficulty providing. The FRC collaborates and seeks assistance with community agencies in order to provide services needed for our families. Parental Involvement programs and activities are also co-sponsored by the FRC throughout the school year. For more information on the Family Resource Center please call 887-7274.